SEDRIS was conceived in 1994. 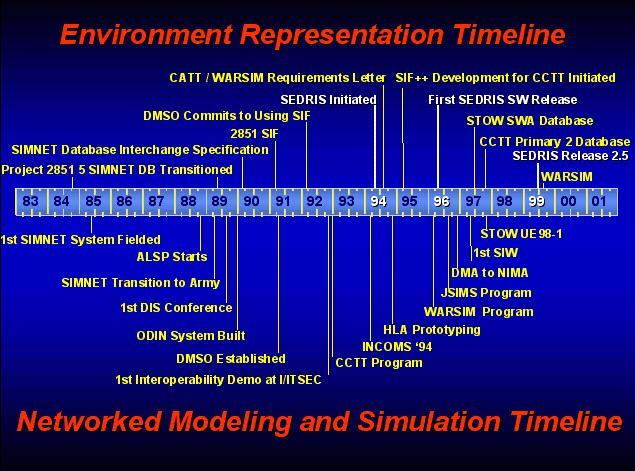 Shown below is the history of its development in relation to a timeline of other significant environment representation and networked M&S events. Between 1996 and 1999, SEDRIS was developed in three phases: data modeling, API prototyping, and format prototyping. In 2000, the SEDRIS technologies were approved for ISO/IEC standardization through ISO/IEC JTC 1/SC 24/WG 8. Shown below are all of the SEDRIS software releases from it's inception.